The City of Yonkers welcomes a new basketball court that was built at Barton Park on High Street and dedicated this week. 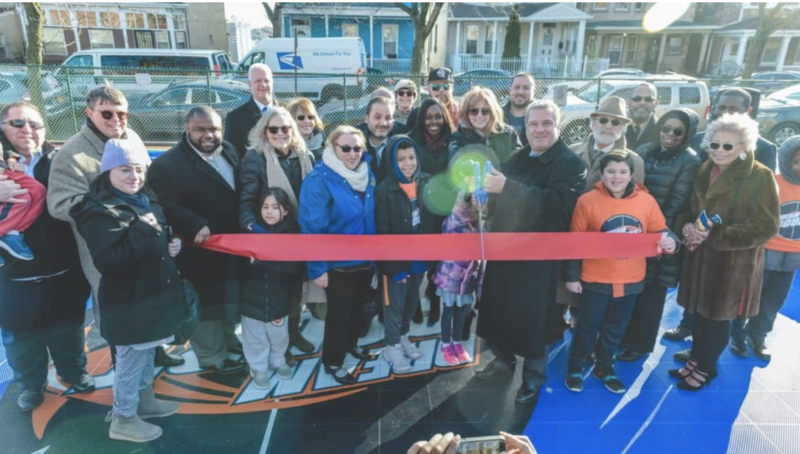 Joining in the celebration – in addition to the many kids and players that will enjoy the court for years to come – were Mayor Mike Spano, Council President Mike Khader, and other key players who made this day a reality. One of the most famous women’s basketball players in history, Nancy Lieberman, and her Nancy Lieberman Charities were on hand to celebrate the day. Lieberman, a Women’s National Basketball Association Hall-of-Famer and the first woman to coach a men’s basketball team, played an important role in getting the court build, along with WorldVentures Foundation and Sport Court, which helped raise funds and create a Dream Court. Dream Courts are top-quality, multipurpose play spaces that are built in underserved communities so children have a safe area to shoot hoops, socialize, and learn about teamwork and good sportsmanship. A grant from the East Yonkers Rotary helped make this day a reality, as did the hard work of Pete Spano, who was the lead fundraiser and made it his mission to build this court in Yonkers. Additional fundraisers and partners included the Westchester School for Special Children and Tom Meier. “After almost five years of charity, work and dedication – Pete Spano’s relentless efforts, Yonkers has finally got their first Dream Court,” wrote Ryan McElroen. John Barton Park sits on half an acre in the city with a playground, swings and sitting area. Joining in the celebration were Councilwoman Shanae Williams, Council Majority Leader Michael Sabatino and County Legislator Christopher Johnson. Pete Spano vowed that there will be more Dream Courts to be built in Yonkers in the days to come. We can’t wait!